Les Vapeurs is a delightful place to have an easygoing, delicious lunch or dinner when vacationing in France’s beautiful seaside towns of Trouville or nearby Deauville. Simple dishes and fresh ingredients abound at Les Vapeurs. Mussels, shrimp, lobster, clams, but also steak and fries are the mainstays. It’s a bustling, inexpensive place in which to eat, while kicking back, relaxing and watching the seemingly never ending crowd of vacationers stroll by on Trouville’s main boardwalk. 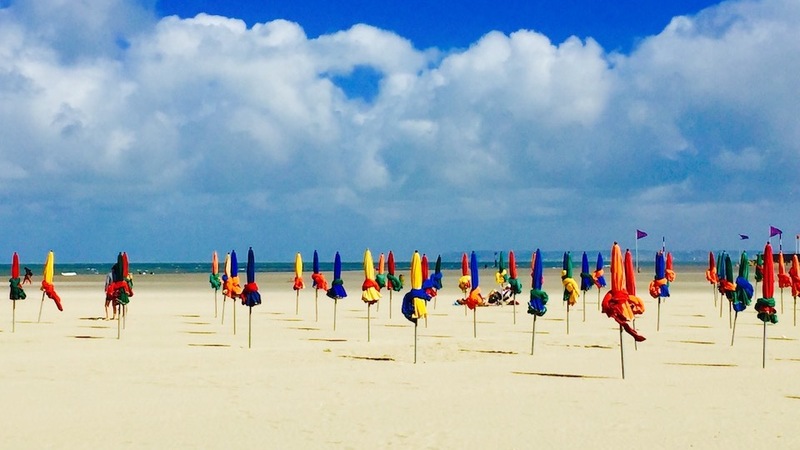 Deauville and Trouville are the yin and yang of France’s Normandy coast. The former is chic and stately, the latter bustling and more down to earth. Curiously enough, though both are packed with vacationers come summertime (and rightly so, given some of France’s most beautiful beaches), neither boasts a truly outstanding, must-go to restaurant. So your best bet when vacationing here is to opt for a solid, easygoing place that offers fresh ingredients and straightforward but precisely cooked fare. Les Vapeurs is just the sort of restaurant seaside vacation memories are all about. After long warm summer days spent strolling around, shopping, surfing, fishing, sightseeing or just lying on the beach, uncomplicated but fresh fare hits all the right notes and is just the type of food I go looking for. Les Vapeurs won’t win any medals for creative or fancy cooking, but it provides reasonably cooked French staples at very reasonable prices and that reach your table without endless waits, despite the throngs of diners seated all round. Call it French-style fast food, if you will. What sets Les Vapeurs apart from many other similar establishments clogging Trouville-sur-Mer’s main street is a dedication to sourcing high quality ingredients such as mussels from Normandy, oysters from Isigny, grey shrimp from the nearby Seine’s estuary, whelks from Granville and thoroughly excellent local cheeses such as Camembert, Livarot, Pont-l’Éveque and Pavé d’Auge. Last but not least, the compact wine list is far better than most other establishments I tried during my time in this charming seaside town, with wines from Beaujolais, the Loire, Chablis and the Rhône from both little known but also outstanding producers to choose from. Les Vapeurs was founded in 1927 by Raphaël Gardon as a small café called Le Grand Comptoir, and was never intended to be a restaurant. When he enlarged the premises by buying the ice cream parlor next door, Gardon looked to change the name of the establishment and settled on “Les Vapeurs” when one of his customers, who was running late to catch her ferry (or vapeur, in French) jokingly told him to call it just that. And he did. Les Vapeurs began serving restaurant-style food only in 1946, after Gardon’s son, Georges, realized that hungry vacationers from Paris had a hard time finding places to eat that were open at all times of day. When, in 1948, the restaurant obtained its license to stay open late at night, it became one of Trouville-sur-Mer’s most popular brasseries, and has been so ever since. In 1992, a smaller bistro, Les Voiles, was opened next to the main brasserie under the same ownership. Moules marinière is a classic Normandy dish that has become a worldwide favorite. 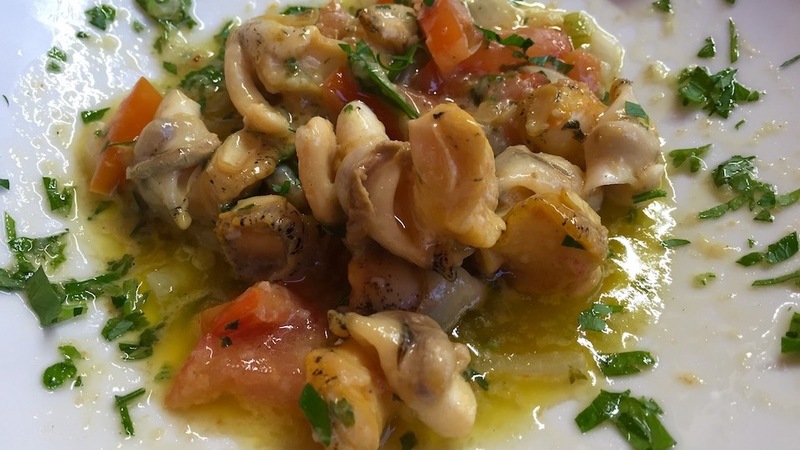 The key to the success of the dish is the freshness and tastiness of the mussels (Normandy’s buchot variety is especially flavorful); and of course there’s no worry about either aspect at Les Vapeurs. The sauce of chopped onion, shallots, leeks and garlic sautéed in butter, spiked with white wine or cider and enriched with fresh whipping cream makes for an absolutely delicious dish. Every time I look at the rather liquid and very flavorful sauce left behind in my deep dish once all the mussels are gone, I always find myself thinking that there’s never a straw around when you really need one! 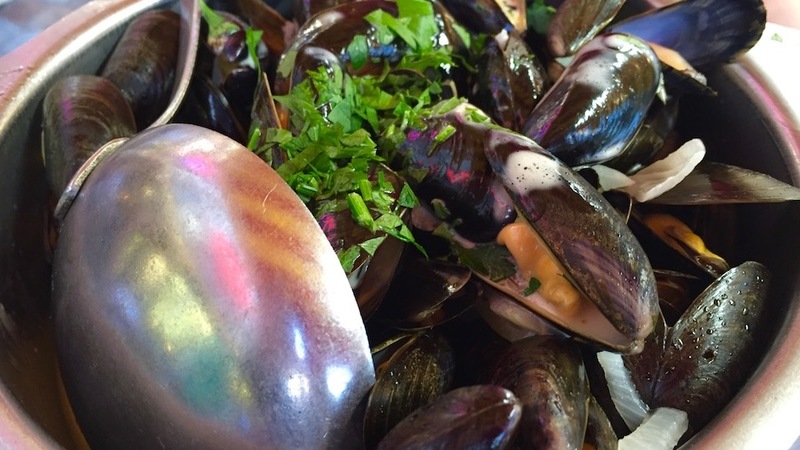 All kidding aside, mussels are very versatile seafood and an excellent source of omega-3, iron, phosphorus and calcium. They’re also sustainable, as mussel farming is now practiced all over the world. In 1235 Irishman named Patrick Walton discovered that mussels clinged to the posts and nets placed to catch birds, but routinely collapsed under the weight of the freeloading mussels. And thus the domestication and breeding of mussels began. Another French classic dish is tarte tatin, perhaps my single favorite dessert in the word (but I’d say the same about a well cooked, warm cinnamon apple or cherry pie); consequently, I’m always in dining heaven in Normandy, which is one of France’s best sources of apples and apple products. 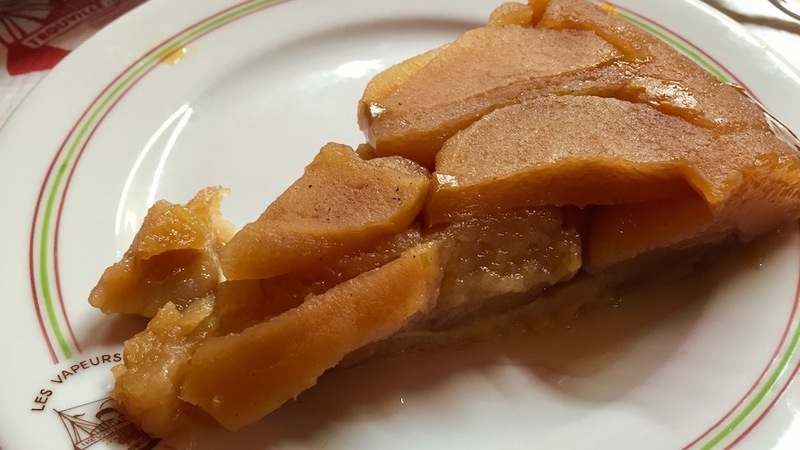 A truly delicious tarte tatin, an upside down fruit tart caramelized in butter and sugar, plays successfully on the contrast between the sweetness of the baked apples and the saltiness of the pâte brisée the apples are housed in. The tarte tatin is a dessert that is part of an old and distinguished tradition, as France’s most famous pastry chef ever, Carême, mentioned gateaux renversés (or upside down cakes) as early as 1841. The tarte tatin itself appears to have been invented only later, and by mistake, by Stéphanie Tatin of the Hotel Tatin in Lamotte-Beauvron in the 1880s. Apparently she and her sister, owners of the hotel, never called the dish so (apparently, the tarte tatin was originally referred to as tarte solognote after the Sologne region; the name of tarte tatin was apparently conjured by Curnonsky, a French epicure as well as by the restaurant Maxim’s, where it was found on the menu in the 1930s as “tarte des demoiselles Tatin”). 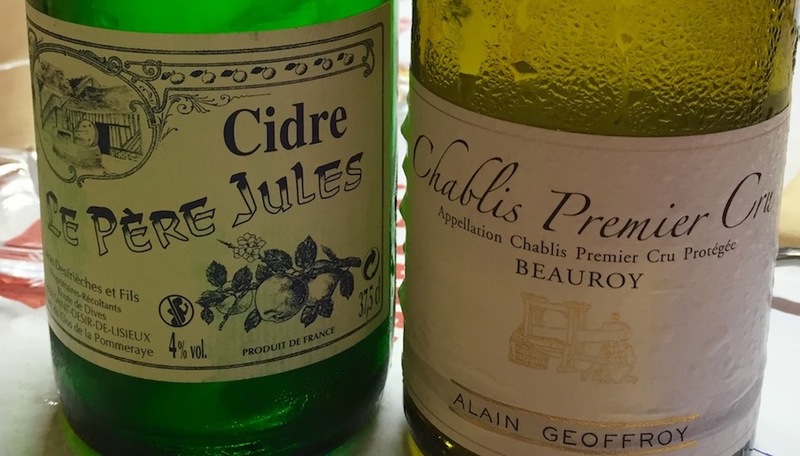 I matched Les Vapeur’s simple food with easygoing ciders and wines. Subscribing to the notion that “When in Normandy, do as the Normands do”, I kicked things off with a refreshing, zingy apple cider. The NV Le Père Jules Cidre de Normandy Brut is the product of an estate in Saint Désir de Lisieux, founded in 1919 that also produces a number of very good Calvados as well. This specific cider is made from twenty different apple varieties that contribute complexity and depth to the cider. Quite dry, redolent with delicate fresh apple nuances and blessed with harmonious acidity, it proved an excellent way to start off the meal. The 2014 Alain Geoffroy Chablis Premier Cru Beauroy is a straightforward Chablis that offers plenty of early appeal and easy drinking charm. Beauroy’s Kimmeridgean subsoil ensures the wines born there have flinty minerality and zingy acidity, but in my experience (and perhaps I am being harsh), most Chablis from Beauroy lack the depth and complexity of wines from some of the more famous Chablis Premier Crus such as Fourchaume, Butteaux or Montée de Tonnerre. However, this wine from the Alain Geoffroy estate, founded in 1840 and located in Beines (which is right next to Chablis) made from 30-45 year old vines provided a solid Chablis drinking experience and a wonderful close to a relaxing dinner during a short and much needed off-season seaside vacation.